Scroll down to listen to the podcast with Mike Fair. 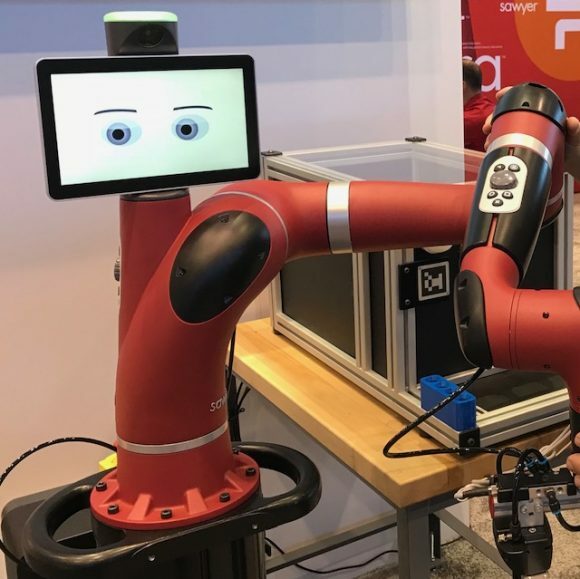 At the 2018 International Machine Tool Show I recorded a podcast with Mike Fair, Product Manager of Rethink Robotics, a robotics company specializing in collaborative robots for use on the factory floor. What sets Rethink Robots apart from several of the other collaborative robot companies I saw at IMTS is that their robot models have people’s names and they feature a display tablet placed in a position to resemble a head. The robot featured at the Rethink Robotics booth was called Sawyer. Rethink’s philosophy is to give collaborative robots, also known as cobots, a personality in order to make them more approachable to the people who work side by side with them. Fair said that industrial robots have always had the connotation of being dangerous. Making the robots more lifelike is the company’s attempt to create a more harmonious relationship between the robot and its coworker. In the interview Fair described Sawyer’s roles on the shop floor, performing the tasks shop workers deem mundane, dirty, unpleasant and dangerous. He said that Sawyer is well suited for CNC machine tending, aiding in loading and unloading parts particularly during jobs with long cycle times. He said Sawyer is also useful for packaging and pick and place processes such as part inspection. Question: Do robots scare you? As a system designer and integrator we have installed over 50 collaborative robots in the last 4 years. It has been great for us and our customers. One point I want to make clear is we are constantly asked about automation increasing unemployment, this is not the case. In almost all cases no one lost their job (unless they wanted to) since the companies were now more profitable and busier. Robots of any kind are presently essential to stay competitive in just about any manufacturing process. They do often eliminate jobs of unskilled workers, but increase the need of skilled workers who build, install, service, maintain and program robots. Robotics is THE elective subject of a great number of high school students across the USA. One of my grandson is competing in the National Robotics Conference. Robotics may be the hope of manufacturing in North America. It captures the imagination of young people and may attract them to the factory floor or office. The cobot revolution is bringing robotics to the human level. We are not talking about the 6 or 8 foot tall Fanuc or Kuka monsters in auto assembly plants. These are $30,000 easily programable human helpers that even novices can program with a few hours of training. They are even training them to do massages in hospitals. They don’t scare me. Look at them as aides. Not commonly recognized is that the agricultural sector is, and always has been, a hotbed of technological development. In the 1880’s almost 80% of the population was part of the agricultural sector and food was expensive. Now about 1.5% of the population’s employed in the agricultural sector and food is cheap. A not insignificant part of the reason obesity’s a national health problem. Even among the poor. What’s that got to do with robots? Well, if you’re not tied into the definition of a robot as clunky mechanical man but a gadget that displaces a man from a job, any job, than a seed drill or a hay baler is a robot. So the onrushing robot apocalypse has been onrushing for, oh, quite a while. My point? Ignore the hyperbole because this sounds very much like the same old song. Things are different but things are also the same. As the podcast demonstrate, there will be opportunities just as there will be dangers. And just to cover your bets get Old Glory insurance. Funny sketch Allen! Good point on Agriculture. Thanks for commenting/reading/maybe listening?